Ride down Pacific Coast Highway 1 from San Francisco to Monterey & Carmel in a comfortable private SUV. See California with a Bay Area born local who has a decade of professional experience. Unlike many limo tours, clear English is spoken. Pass Santa Cruz, a lighthouse and marine sanctuaries on the way. We will try and spot wildlife like shorebirds, sea otters, whales and seals. Take free time at Cannery Row for shopping, lunch or a visit to the Monterey Bay Aquarium. 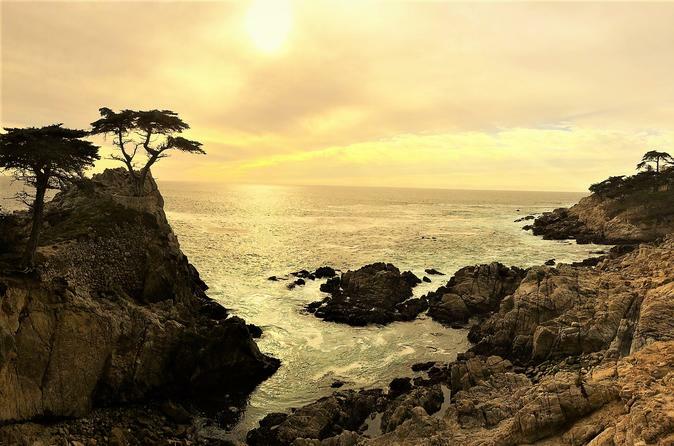 Experience the scenic coastal road through Pacific Grove and 17 Mile Drive. Pass beaches, seaside mansions and the historic Pebble Beach Golf Course. If you are a fan, feel free to stroll out to the 18th hole viewing area or look at the old Hollywood photos on the walls of the clubhouse. Our last big stop is Carmel-By-The-Sea. Enjoy the cottage style architecture while shopping on Ocean Ave. Walk on the beach or enjoy a snack in one of the many cafes. Start time is flexible, just send me a message. 9:00 Depart from your San Francisco accommodation. 10:30 Optional rest stop at an 1872 lighthouse or the seaside town of Davenport for coffee or a pastry. 11:15 Pass through the surf capitol of Santa Cruz, CA. 12:00 Stop at Moss Landing to search for seals, otters & shore birds. 1:00-2:30 Free time in Monterey (optional aquarium, pick up or sit down for lunch). 2:30-3:30 Coastal drive through Pacific Grove & 17 Mile Drive & Pebble Beach. 3:30-4:30 Free time for the beach or Ocean Ave shops in Carmel-By-The-Sea. 7pm return to San Francisco. Commute traffic may delay the return journey. Extra free time is $100 per hour. Transportation for 1-7 passengers is provided in an extended 2015 Ford Expedition EL XLT equipped with 4-wheel drive. Selected for its size, this comfortable vehicle has leather seats and a full 3rd row with 17% more leg room than other SUVs of its model year. This modern vehicle is clean and has working air conditioning and heating.